When it comes to indigenous films, the story that is told is usually one of heritage and cultural identity. However, current indigenous stories told by indigenous filmmakers involve a different platform. Indigenous documentary films are about raising awareness related to issues indigenous people face today. Documentary films seek to educate and can be a significant catalyst for change. Ultimately, millions of viewers can be influenced and begin to see another perspective. Documenting indigenous stories can bring heart-based indigenous wisdom to mainstream audiences, and this is all the more important since we need to learn from the elders, affectionately known as “the wise-ones”. We need to listen to their stories on sustainability, their ways of managing natural resources and to gain another perspective. Emmanuela Shinta, founder of the upcoming Bali International Indigenous Film (BIIFF), to be held on May 10-12 in Ubud, Bali, explained, “There are some films in the industry featuring indigenous people, but mostly it is more about showing indigenous people as an object for the need of the entertainment. My team at Ranu Welum Foundation, the organizers of BIIFF Films, has carefully selected a range of 40 indigenous documentary films for screening at the film festival in May, which includes international and Indonesian films. Films play a crucial role in shaping the public paradigm and are a powerful tool in education. As an indigenous person myself [Dayak Maanyan], I have a passion for bringing cinema to a wider community, enabling indigenous people to open up to the possibility of having a dialogue with the wider world." Twenty-five directors and presenters will fly to Bali for the second BIIFF, to show their films and engage the audience with Q & A sessions. 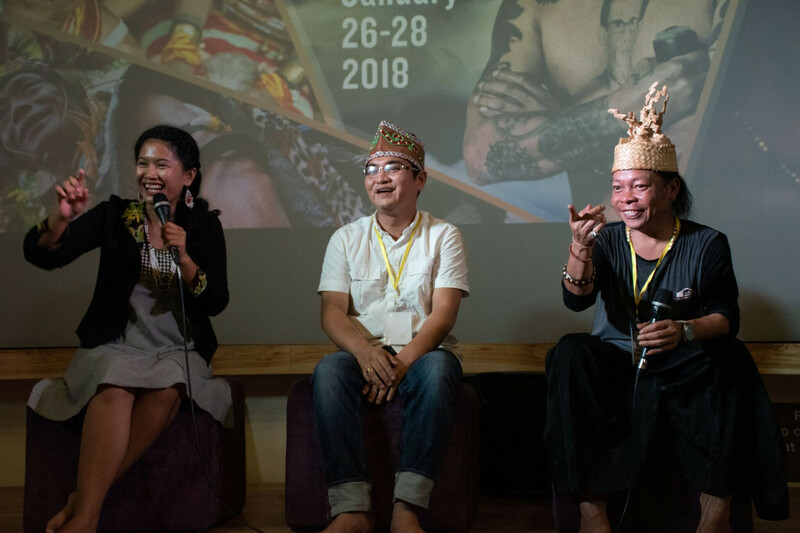 The festival is making history as it is the largest gathering of indigenous filmmakers ever in Bali. Award-winning films such as The Borneo Case will see Pieter Jon Jaban, the 30-year-old activist from Malaysia, Borneo, presenting along with Canadian Indigenous film unit Wapikoni Mobile. From Australia, Luke Barrowcliffe, the director of Corroboree, an Aboriginal documentary will present along with Surya Shankar, a 16-year-old veteran filmmaker who documents the plight of the indigenous people of Odisha, India. From the Peruvian Andes, Jeffrey Humanchiq Wium, a western-born lineage holder of the Andean Holy Mountain who spent over 10 years documenting the Wisdom Keepers project, will present his new endeavor, Children of the Sun. It documents the messages of the indigenous elders. Food from the Forest is a film from West Kalimantan, and one of four documentaries Nanang Sujana will be presenting at BIFF. Nanang is an award-winning documentary filmmaker from Sumatra, whose footage has been used by National Geographic, The Guardian, HBO, PBS and other major broadcasters. If you want to learn about the 1 million people who depend on the forests and trees for food security and nutrition, then this documentary tells of the safety net that tribespeople feel is slowly disappearing. Considering climate change, gender disparities within gathering and collecting food and how to improve access, we will learn about sustainable foods from the forest along with the current situation in West Kalimantan and how food foraging allows local people to keep living sustainably. Sekala Niskala (The Seen and Unseen) is a haunting story by Indonesian writer-director Kamila Andini which evokes the communion between the supernatural world and twin siblings. Told from a child’s perspective, you are taken on a journey of pain and loss through the timeless language of ancient Balinese arts and spirituality. If you want to learn a little more about Balinese mysticism, this film takes you through a few twists and turns and delivers some strikingly beautiful imagery. Marie’s Dictionary is a documentary film about an indigenous language by director Vaughan-Lee and tells the story of Marie, the last fluent speaker of the Wukchumni language from North America. In the later years of her life, Marie decided to write down a dictionary of the Wukchumni language so when she dies, the language can live on. She is the last person who speaks the language of her forefathers, and she feels the need to keep this language alive. Marie’s Dictionary has been released under the label Project Films, which tells indigenous stories from all over the world. Project Films works with many prominent organizations such as National Geographic. A Time to Swim is a powerful feature documentary film by Duong Ashley, a Canadian filmmaker. The story follows the life of Mutang Urud, who is an activist for indigenous rights in Borneo. The film explores how the destruction of a place can affect the fabric of a community. Mutang has been in exile in Canada for the last 25 years. He searches for ways to belong in the Western world and how to embrace his duties as a stay-at-home dad in Montreal. He struggles with the notion of home and how his heritage is slipping away. The Songkeepers is an Aboriginal film by Naina Sen, a documentary filmmaker producing content for PBS and ABC Australia. It is a charming, heart-warming, funny and inspiring film about an aboriginal women choir who take a historical tour of Germany. “Stories That Matter” is the theme of the second Bali International Indigenous Film Festival, held on May 10-12. The festival will screen 40 films from 14 countries, and 25 indigenous directors will be in attendance with Q & A sessions. Buy the tickets here. Stephanie Brookes is a travel writer and blogger with tales from Indonesia and beyond. She's the author of Indonesia’s Hidden Heritage; Cultural Journeys of Discovery. Find her on Facebook and Instagram. David Metcalf is a photographer and cofounder of the Bali International Indigenous Film Festival and runs cultural photography tours in Bali, Kalimantan, Native American Lakota lands of South Dakota (United States), Alaska and Japan. Find David on YouTube and Instagram.